When on a hurry, and friends drop over unexpected is always nice to make something quick and full of flavor. I always fall into saying, look at your staples, what do you usually have at home. Here is a list of my staples, which allows me to hurry up and do something. Frozen: quickly wilt spinach on a steaming pot and freeze in bags, Charred Sweet and Hot Peppers (all colors). Let's know use what we have there to make something yummy. Quickly, beat the re-fried beans with some salt, cumin, pepper, chili and oil. Taste. spread a thin layer of sour cream over the first one, quickly repeat with salsa, top with rinsed black beans, olives, cilantro, and minced fresh jalapeno if available. Add 1 part sour cream, 1 part yogurt, add a little bit of minced garlic, shallots and parsley, fresh ground pepper (a must). 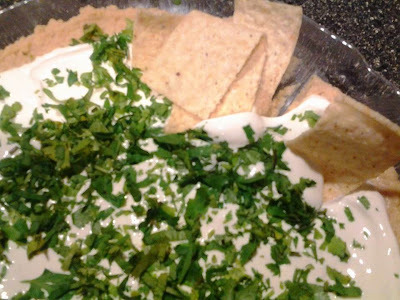 All ingredients are to taste, but if you need to make about 1 cup of dip, then start by 1/3 cup each of sour cream and yogurt, then add the rest to taste. Now, let's change it: spice it up a bit, add chili powder and some cumin. To about 1/2 cup Mexican Crema, add Chipotle Paste, to taste, add minced garlic, shallots, cilantro and diced tomatoes. Mix and serve, great with veggies. I will repeat keep adding to this post, with some other quick dips, but mean while i hope everyone enjoy the fun of making a quick something, something at home.